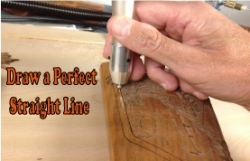 Positively the simplest and fastest way to engrave a straight line! Slips into the handpiece and is easily installed by set screws and an alen wrench which are included. The sleeve can be used with any ruler or straight edge and also serves to regulate the depth of cuts made on wood.